The city of Florence (Firenze) is famous as the birthplace of the renaissance, and has many outstanding museums and cultural sights, also counting both food and fashion as major tourist attractions. With a population of over 380 000, the capital of the region of Tuscany is also one of Italy’s most prosperous. The first tramway was inaugurated on 5 April 1879; horse-drawn, it linked the city centre to Peretola. Horse-drawn tramlines soon expanded to cover the city, while steam-hauled interurbans were also being opened, starting with the one to the town of Prato (around 25km/15.5 miles to the north-west) in October of the same year. Steam locomotives were not conveniently capable of attacking the steep slopes of the route to Fiesole however so, after consideration of conversion to electric traction throughout the 1880s, on 19 September 1890 the first electric tramway line in Italy – linking Firenze with Fiesole – began revenue service. Technically an interurban line, since it was linking two different comuni, this was the nucleus of an urban electrified network that had replaced the horse-drawn tramways by 1899. By the middle years of the 1920s, the system comprised 26 urban electric lines and five interurban steam-powered lines, running on around 200km (125 miles) of mostly single-track routes. From 1938 the network had already been reduced by trolleybus replacement, particularly on the lines to the northern hills (Fiesole, Trespiano, Settignano), followed by some lines to new areas of residential and industrial expansion to the flatlands of the east and the west, and later by the first diesel buses. the continuation of the tramway for another decade. As in many other Western European cities, the advance of the diesel bus easily won over an ageing street-running, often single-track, network served by obsolete vehicles. At 01.15 on 20 January 1958, the last tram of the only surviving line returned to the depot to join a dormant fleet that would be scrapped in the coming months, leaving no examples for preservation purposes. The ‘tram sferraglianti’ (metal-rattling tramways) were soon forgotten in favour of modern-looking diesel buses at a time when air pollution was not an issue on the mainstream agenda. Yet they were not forgotten in the common language – even today, many Florentines use the term “prendo il tram” when boarding an urban bus. eye-catching novelty would have been the fleet of nearly 50 double-decker buses in the early 1960s that served the most crowded routes through the narrow central roads. The trolleybus network closed in the early 1970s, with several vehicles sent to the Greek city of Athens, leaving a bus-only network that later operated 100 articulated vehicles on the longest and most crowded lines to the peripheral urban centres, from the mid-1980s. The growing awareness of urban mobility problems led the municipality to consider the possibility of realising a modern mass transit system in the 1980s. As in other European cities, two opposing solutions were considered: light metro (to be built underground) and a modern tramway. In 1996 a solution based on a fast tram system – or light rail transit as we might call it now – prevailed, and was confirmed in the town plan revision of 1998. This tramway programme could also benefit from an agreement with the Italian State Railways (Ferrovie dello Stato – FS) which entailed economic contributions and engineering services as compensation to the city because of the disruption associated with construction of the high-speed railway line. A mobility plan defining the network was approved in 1999, consisting of three lines: two diametral (west to east, Scandicci – Rovezzano, and north to east, Careggi – Viale Europa) and one radial (north-west to downtown, from the city’s international airport to Piazza Beccaria). Construction began on the radial western stretch of the first line, from the Scandicci terminus to the main railway station, Santa Maria Novella, with EUR250m in financing obtained from the State, the Municipalities of Florence and Scandicci, and in smaller proportion, the European Union and State Railways. A limited batch of works started in 2001, with the bulk beginning in 2004, including the creation of a depot and workshop appropriately sized for the future extension of the network. Various difficulties were encountered during the works, which consequently lasted longer than expected. The project underwent numerous changes, due to new requirements of local administrations and the intended operator, which caused delays and partial redesigns. Grooved rails with concrete embedded bi-block sleepers were laid to standard gauge, using elastomeric support pads in areas sensitive to noise and vibration. A variety of surface finishes are seen depending on location: porphyry setts in the historic city centre; sedum mats on peripheral avenues of the Scandicci stretch; synthetic resin-bonded grit to imitate park paths on the section around Cascine Park features; with the remainder and road crossings featuring an asphalt top layer. The line, and subsequent extensions, are electrified at 750V dc via overhead power supply. Construction was further hindered (common in street-running tramway and light rail projects) by the diversion of unexpected utilities and significant archaeological discoveries: the remains of an Etruscan house, an 18th Century river port quay, as well as walls of as yet unknown origin have been found and required investigation and preservation. Another source of delay and cost increase came from difficulties in disposal of contaminated soil discovered during the excavations. Short interruptions were also undertaken at the request of shopkeepers keen to not impede customers’ access during periods of greater commercial activity. The first 7.7km (4.8-mile) section was inaugurated on 14 February 2010 as line T1, with an additional 600m branch to the depot, near the Villa Costanza terminus in Scandicci. Between the two termini there were 12 stops, with distances between 312m and 1023m, according to the density of residences and other urban functions. All stops feature waiting shelters, digital information displays, CCTV and ticket vending machines, and are laid to either island or side platform layouts depending on the road configuration. The original Alamanni terminus, now a stop, was located by a side entrance of the main railway station, allowing easy interchange with rail services. The Scandicci terminus, near the A1 (Milan – Naples) motorway, was subsequently completed with a large car and bus interchange parking facility. 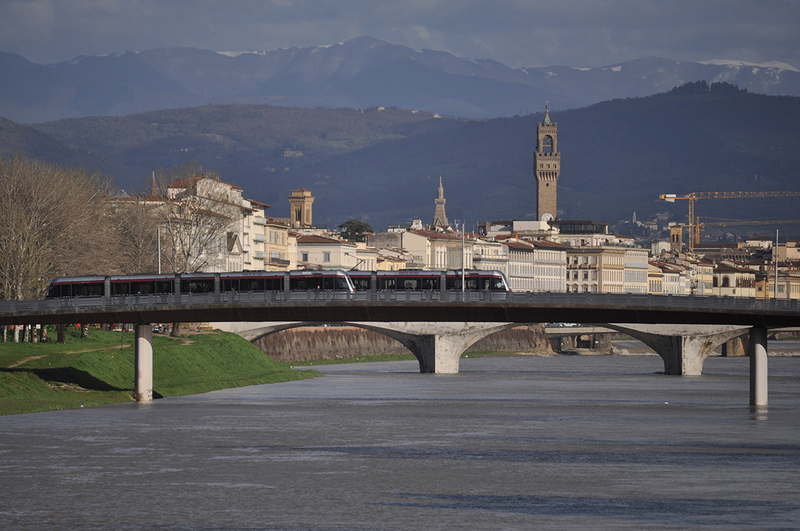 Along the line, five important structures have been created: a bridge across the Arno river (124m long and reserved for trams, pedestrians and bicycles), the widening of a pre-existing bridge across the Greve river and, to eliminate critical and complex crossings, two subways and a viaduct. The first section is basically level, with significant slopes (up to 7%) only on some short ramps. A decision was taken to preclude other vehicles from the tram lanes (with the exception of emergency vehicles and only on paved stretches) and to provide all crossings, vehicular and pedestrian, with traffic lights controlled by a centralised tram priority system based on arrival forecast. Thus, safety is ensured, together with good commercial speed (19.5km/h) and regular headways. The tramway is operated and maintained by GEST, an RATP Dev company (initially a joint venture of ATAF and RATP Dev), under a 30-year concession from the opening of new lines. The first section met with great success, with patronage reaching 44 000 weekday passengers within a few years, against a forecast of about 30 000. It is interesting to note that the load diagram during the day is almost flat, an important goal for public transport and seldom achieved. This shows how T1 has attracted many non-systematic users, usually the most difficult to attract to public transport. A significant modal shift was also achieved, confirmed by a 2012 study with 24% of passengers declaring that they were car or motorcycle users before the tramway opened. In 2005, with works on the first line underway, the City signed a concession with Tram di Firenze S.p.A. (a consortium constituted of RATP, ATAF – subsequently substituted by an investor – civil engineers and the rolling stock manufacturer) for the design, construction and operation of the two new lines towards the Careggi hospital and the Airport, as well as operation of the expanded network. The actual start of the works for the T1 extension from Santa Maria Novella to Careggi hospital (for a long time known as line 3) and for the T2 line, from the Airport to Piazza dell’Unità close to the city’s historic centre, dates back to 2007. That was when utility relocation was carried out in two main streets where the two lines should have been built. From the beginning protests against the necessary removal of several trees in Viale Morgagni fuelled anti-tram sentiment, and the works did not progress further for years, plagued by delays, political fighting and cashflow problems. The stretch of line 2 due to serve the historical centre, passing by the 15th Century Duomo, was cancelled by the new city council in 2009 when the area surrounding the Duomo – a UNESCO World Heritage site – was pedestrianised and closed to all motor vehicle traffic. This cutback did not help as the economic structure supporting the development of the tramway lines was in part based upon the revenue foreseen from the important tourist traffic for the area. Eventually construction resumed and (slowly) proceeded, and the first Sirio tram reached Careggi to start testing on the evening of 9 February 2018, placed on the tracks from the back of a truck since the rails connecting the new section to the existing line and the depot were not yet ready. The extension opened to the public on Monday 16 July, with free rides offered on this section for two weeks. The extension is on reserved right of way for its full length, but features more intersections with car traffic than the existing section of T1 as it runs in a denser urban environment, with narrower roads. For this reason, in order to allow access for emergency vehicles, a paved surface has been preferred over the grassed reservation used for large sections of the Scandicci –Alamanni stretch. Operating speeds are also lower here for the same reason; around 14km/h (9mph). The new tracks join those already laid behind the church of Santa Maria Novella in front of the main train station and – after a delta junction that will be used by the T2 line to reach its Piazza dell’Unità terminus – the trams reach another stop on the other side of the station, opposite the already operating Alamanni stop, and serving the Palazzo Congressi as well. The new line then passes the Fortezza da Basso, a 14th Century fortification that now hosts the main exposition and trade centre of Florence, with two nearby stops located over two road underpasses. The first was built 15 years ago with the aim of giving easier access to the Fortezza without crossing the heavy traffic of the previous boulevard; the other was an integral part of the tramway construction, and its surface hosts a new garden surrounding the tramstop. Next it proceeds along the long straight road named in its first stretch via dello Statuto, cutting under the Firenze – Roma railway and the regional train stop Statuto, with a tramstop nearby. This road, with its central line of trees from the 1930s, was completely renewed as part of the tramway project which runs in central reservation, with a new line of trees to replace the ones that had to be removed. At the upper end of this road, with its steep slope, the route diverges using Via Vittorio Emanuele towards Careggi and via Pisacane in the opposite direction, joining again in Piazza Dalmazia, the commercial heart of the Rifredi district. The last straight run follows Viale Morgagni, where a stop serves the student houses and University premises before arriving outside the newly-built entrance of the Careggi Hospital, the largest such facility in Tuscany. Given the size of the hospital, it was decided to continue laying tracks to directly serve its northern part, which includes the important Meyer children’s hospital. But these plans did not materialise and, in the opinion of the authors, this was a missed opportunity as the tram service could have been designed to better penetrate the hospital campus, already partly pedestrianised, to provide a far better and more convenient service. Given the key passenger generators along the line as listed above, the opportunities for significantly growing patronage on T1 are obvious. The first weeks of service have shown positive results. Overall, T1 now runs for 11.5km (7.1 miles), with 22 stops between the two termini in each direction (two stops are in the section of the line where the two directions run in separate streets, hence are doubled). Produced by AnsaldoBreda (Hitachi Rail Italy since November 2015), the Sirio has been used by the Florence tramway since the beginning. It is a family of modular, multi-articulated, 100% low-floor vehicles (entrance height at 350mm above the top of the rail) which serves four other Italian cities (Milano, Bergamo, Napoli and Sassari) as well as systems in Greece, Turkey and China. The latter are built under licence by CRCC Dalian. Here it is a double-ended 32m version with five sections, the second and fourth suspended from the adjacent bodies; motor bogies are located under the first and fifth sections with a trailing bogie under the middle section. The traction system is equipped with two IGBT inverters for each motor bogie, rated at 106kW. At 2.4m wide, each vehicle has a capacity for 210 passengers, 42 seated plus eight folding seats, at the acceptable density of four passengers/m2. Four wheelchair places are also provided. Like all Sirio variants, these have air conditioning, with separate equipment for cabs and saloons. The first 17 are numbered 1001-17 and to cover the needs of the T1 extension and line T2, a further 29 trams of the same type (2018-46), have been added (22 plus 7). It is worth noting that lessons learned from the first line have resulted in the development of an improved wheel profile for T2 and the extension of T1, eliminating the raised groove in the switch frogs and to improve the quality of wheel-rail contact. The tyre width was also modified from 84mm to 105mm and the radius of the tyre-flange transition has been adjusted. Tyres on trams from the initial delivery have been changed to match and the track of the first stretch has been checked to avoid contacts of the tyre out of the rail.